‘Ruth will eat anything’ by Simon Kellogg, © 2016, Flickr, licensed under Creative Commons Attribution 2.0 License.Yum. They looked like any other Googlers, tapping away on their laptops while sitting in a common area in the Google New York office. But in reality, they were spies. Scientists had sent them there on a single reconnaissance mission: observe the snack choices people made while walking through the nearby “micro-kitchen,” or the break room. The micro-kitchen was designed so that one beverage station was located about six feet from a snack bar containing M&Ms, nuts, and other treats. The other beverage station was located about 18 feet away. The team of scientists, which included Google’s global food, health, and wellness program manager, wanted to know: Was the setup of the micro-kitchen affecting people’s snacking behaviour? Specifically, would Googlers who took a drink from the station closer to the snacks be more likely to grab one than those who used the beverage station farther away? 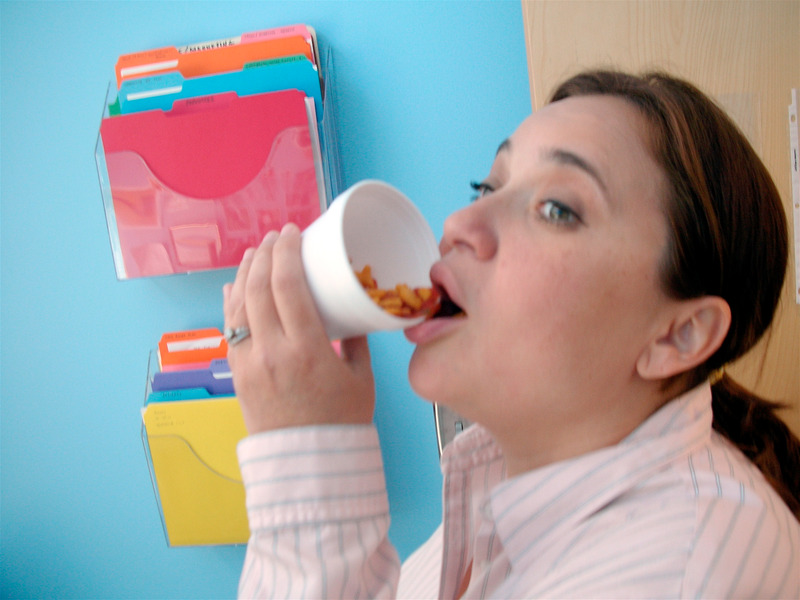 After analysing over 1,000 beverage choices, the researchers concluded that the design of the micro-kitchen did, in fact, have a big effect on snacking behaviour. Googlers who visited the beverage station closer to the snacks were a whopping 69% more likely to snag a snack than those who used the beverage station farther away. The findings, cited by the Association for Psychological Science, will be published in the August issue of the journal Appetite. Of course, it’s possible that people chose a specific beverage station because they wanted a snack or wanted to avoid temptation — and not just because their desk was located closer to one beverage station or the other. But the researchers effectively ruled out that possibility because they only observed a few employees walking past one beverage station to use another. Another interesting finding: Men were much more influenced than women were by the proximity of snacks. Men were about twice as likely to grab a snack when they used the beverage station nearby; women were only about 25% more likely. The researchers put these results in perspective by calculating that a 180-pound man who drinks three beverages a day and uses the station closer to the snacks could wind up eating an additional 81 snacks per year. That means he could gain at least 2.5 pounds a year. This study is hardly the first time Google’s experimented with tweaking its office environment to help employees develop healthy habits. For example, according to The Washington Post, a few years ago Google decided to conceal M&Ms in opaque jars and display healthful snacks like dried fruit in glass jars. Possibly as a result, New York Googlers ended up consuming 3.1 million fewer calories from M&Ms over the course of seven weeks. In another experiment, reported in The Harvard Business Review, researchers promoted relatively unpopular vegetables as the “vegetable of the day” with photos and trivia facts next to a dish featuring that vegetable. The number of employees who tried the dish increased by 74%. These solutions might seem ridiculously simple — like something out of a kindergarten class — and they are. That’s the beauty. If you’re looking to avoid mindless snacking and packing on the pounds at work, consider advising your office manager to rearrange the food and drinks in the kitchen or the break room. If that’s not possible, at least be aware of the fact that you’re more likely to snack when the good stuff is right in front of your face.